Completing a circular journey this trip takes in ancient temples and fortresses, cycling through tea plantations and across the scenic trails of the Knuckles Range. Leaving the coast behind we explore the ancient city of Polonnaruwa on two wheels before steadily climbing to wide plains. Search for leopard in Yala National Park before making our way to the beach for a well-earned rest. Our adventure begins in Negombo, just a short drive from the Sri Lankan capital, Colombo. After a chance to relax and freshen up we are introduced to our bikes, spend some time ensuring everybody is happy with the fit and making any necessary adjustments. Then, time permitting, we take our first ride in the late afternoon, exploring the coast of Negombo with its colourful fishing boats and relaxed people. A gentle introduction to Sri Lanka's beautiful landscapes, the ride covers some 10 kilometres before we head back to the hotel before dark. Leaving after breakfast we drive (30mins) to Dankotuwa this morning, from where we begin our morning's cycle ride through small backroads, gravel or dirt roads (15km) and lovely forest to the outskirts of Kuliyapitya. Please note that the road surface for today's ride is in a poor state of repair. Arriving in Kuliyapitya, we then transfer by bus (2.5hrs) to Dambulla for a visit to the UNESCO World Heritage Site, breaking our journey with a lunch stop in Kurunegala. Dambulla has a great series of caves which hide an incredible collection of temples, Buddhist images and Hindu sculptures that date back to the 1st century BC. After our visit we continue by bus a very short distance to our hotel. Our total cycling distance today is approximately 38 kilometres (total 390 metres accumulated ascent and descent). First thing this morning we cycle (24km) alongside lakes and canals to Sigiriya. We then leave the bikes as we climb the imposing 'Sky Fortress' of King Kassapa, whose 5th century ruins are one of the country's major archaeological attractions. A UNESCO World Heritage Site, the fortress is accessed by way of a series of steep steps that take us past the famous frescoes of the 'Sigiriya Damsels'. Returning to the base of Lion Rock, we drive (45mins) to Minneriya where the second leg of todays ride commences. Back on our bikes we ride to the ancient city of Polonnaruwa. Our route follows a series of relatively straight and flat backroads through a landscape dotted with forests and villages, with around 10km on decent dirt road. Our total cycling distance today is approximately 50 kilometres (total 340 metres ascent and descent). Polonnaruwa reached the height of its glory in the 12th century and the city is still blessed with a number of ancient monuments, including the spectacular ruins of its Royal Palace and the Circular Relic House, a curious structure with a beautifully preserved 'moonstone' carved at the foot of a flight of steps. We spend this morning cycling around some of the area's major archaeological sites, before continuing on bike after lunch to explore the villages near Parakkrama Lake, one of the country's most impressive ancient reservoirs. Around 4km of today's route is on gravel or dirt roads. Our total cycling distance today is approximately 33 kilometres (total 210 metres ascent and descent). Today we cycle through the Knuckles Range and on to Kandy, one of Sri Lanka's cultural highlights. We begin our day's ride from our hotel and cycle alongside Parakrama Samudra reservoir - built by the Singhalese kings in the 12th century - always staying close to Wasgamuwa National Park. Our ride ends before we get to Pallegama and we get back in the vehicle to drive up into the Knuckles Mountain Range. These striking landscapes and isolated cloud forests provide a haven for a rich diversity of flora and fauna. After around an hour and a half we reach the highest point at Riverston pass. From here we descend for about another hour and half to Matale Spice Gardens where we plan to visit. Finally we drive (1hr) on to Kandy and our accommodation for the night. Our total cycling distance today is approximately 61 kilometres (total 600 metres ascent and 500 metres descent). With no cycling planned for today we have some free time to enjoy one of the country's cultural gems. Lying in the mountains to the north-east of Colombo, Kandy is renowned as a centre of spiritual and cultural importance. The city is home to the famous 'Temple of the Tooth', whose jewelled shrine is believed to hold the left canine of the lord Buddha. It was also the last capital of the Sinhala Kings and still retains much of its old world charm; its wonderful mix of colour and vibrancy making it an ideal spot to explore at our own pace. Leaving Kandy this morning we drive for around two hours through a picturesque landscape of rolling, verdant hills into Sri Lanka's central highlands. On our journey we will stop at a tea estate to learn about tea picking and processing and to see the impressive Ramboda Falls. Keen cyclists have the option to ride on good (albeit steep!) tarmac before reaching the tea estate and there is also the option to ride the final 18km section up to our hotel in Nuwara Eliya. Following the tea factory visit we continue on foot through the tea plantations to a Tamil hamlet and will hopefully meet some families of tea pickers. Those not riding the optional sections will make the journey by bus. Nestling amongst the lush, cool hills, nearly 1,900 metres above sea level, Nuwara Eliya was once a summer retreat for the British and still retains a distinctly colonial feel that harks back to its 19th century origins. Our total cycling distance today is approximately 18 kilometres (optional) (total 900 metres ascent). In the morning we leave the hotel, cycling out through the highlands towards Badulla. Later changing direction to ride through the tea estates to Haputale on the southern, increasingly lush and tropical slopes of the mountain. Whilst the overall bias is on downhill, later in the day there are a few undulating and hillier sections as well. Later we can make a de-tour to visit the Bambarakanda Waterfall, the highest in Sri Lanka, before arriving at our hotel. This evening dinner is included. Our total cycling distance today is approximately 68 kilometres (total approx 970 metres ascent and 2200 metres descent). Today we cycle through the spectacular southern slopes of the highlands via Rajawaka and Pallebedda until reaching Highway 18 where our ride ends. We then drive (30mins) to the Elephant Transit home for the chance to see the feeding of baby elephants. Afterwards we either drive to our hotel in Embilipitiya with free time this afternoon to relax, or alternatively have an optional 4WD jeep safari in Udawalwe National Park. The park is famous for its large elephant herds and has many other game to look for, from buffalo to sambar deer plus many bird species. This evening dinner is included. Our total cycling distance today is approximately 37 kilometres (total 420 metres ascent and 830 metres descent). Turning south-east this morning, our cycle route leads us to the town of Kataragama where we spend the night. We plan to visit the interesting local temple dedicated to Hindu and Buddhist gods. Lying close to the beautiful and abundant landscapes of Yala National Park, our afternoon arrival provides us with a chance to enjoy an optional game drive through the park. One of Sri Lanka's more popular reserves, Yala is home to a rich diversity of ecosystems and is blessed with an abundance of wildlife, including sea turtles, sloth bears, one of the world's highest concentrations of leopards and over 215 species of birds. We use one of the less frequented Yala park entrances, around 40 minutes drive from Kataragama. Our total cycling distance today is approximately 49 kilometres (total 320 metres ascent and 370 metres descent). This morning we drive (30 mins) to the coast and then cycle the first 23km section along the coast and Bundula National Park, giving us a good chance to spot crocodiles. We then get back in the vehicle and drive for around an hour to a point beyond Tangalla. From here we cycle again following back roads heading to the west. Our cycle ride ends in Matara where we get back on the bus again and drive (20 mins) to the hotel in Mirissa. Around 20kms of today's ride is on gravel or dirt roads. Our total cycling distance today is approximately 65 kilometres (total 600 metres ascent and descent). We cycle from our hotel this morning, through the backroads, with a possible option to visit an Ayurvedic snake doctor. We explore the Weligama Bay area further on our bike route that eventually leads us back to the hotel in time for lunch. Later this afternoon we drive for around 40 mins to Galle for a stroll through the old town. Our total cycling distance today is approximately 33 kilometres (total 380 metres ascent and descent). Today has been left free to enjoy the laid back ambience and turquoise waters of Sri Lanka's southern coast. Rich in biodiversity, colonial history and golden beaches, the area offers a wealth of options to make the most of our last day in the country. There are also snorkelling trips available, ayurvedic massages and even the possibility of enjoying a whale-watching trip during the migration season (December to April). After breakfast we drive (2.5hrs) to Colombo airport where the tour ends. In general pack for warm and hot weather. However, you must bring a warm sweater or jacket for cycling on cool days and for wearing during the evenings. We recommend you bring padded cycle shorts, cycle gloves and quick drying cycle shirts. In case of rain, waterproofs are essential. When visiting religious sites you will need to dress respectfully by covering your knees and shoulders plus taking off your shoes and hats. You may like to wear socks for temple visits as the ground can get very hot and burn the soles of your feet. You will need to bring long trousers, or buy a sarong locally. Although entirely voluntary, tipping is a recognised part of life in this region of the world. Some local staff will look to members of the group for personal recognition of particular services provided. In order to make things easier for you, the Tour Leaders may organise a group's tips kitty and if this is the case, they will account for it throughout the tour. Accordingly, you should allow GBP 40 for tipping. Simple - These are often small, family run establishments or campsites which provide a no-frills experience with adequate amenities and service standards. Sleeping arrangements are simple, sometimes with en suite facilities. Accommodation in Sri Lanka is as varied as the country itself. On the Cycle Sri Lanka itinerary, we stay in a mix of hotels of varying standards. Most of these are decent 2 to 3 star hotels, but you may sometimes feel that a hotel is simpler than expected as the standard can vary from standards in the UK. So, it's best to approach each accommodation with an open mind. Service can be slow in places especially when travelling with a group. Sri Lanka: A visa is required by all nationalities. All customers, including those in transit must apply online for travel authorization, prior to departure. You should visit http://www.eta.gov.lk to apply for the ETA (visa). It is strongly recommended that you print and bring a copy of the ETA approval notice with you. 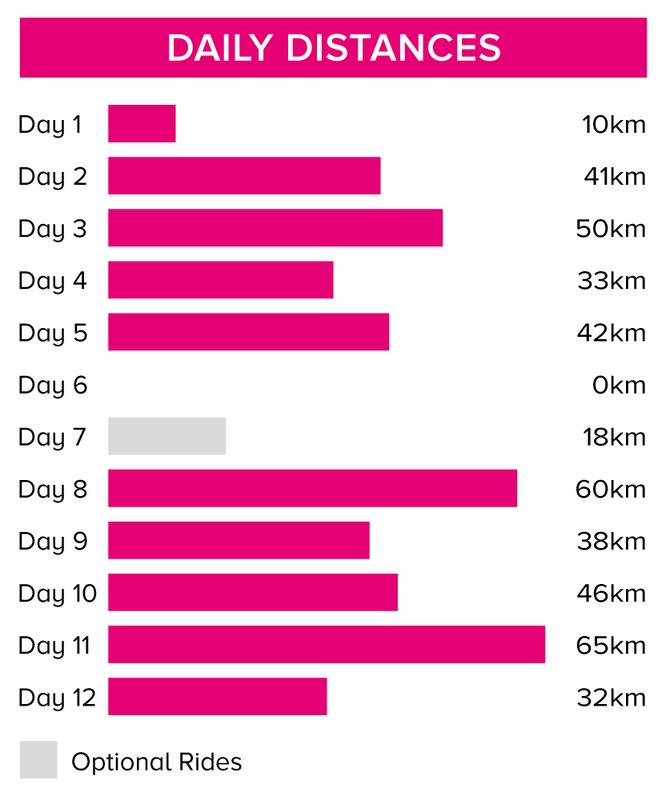 On this tour we cycle 436 km over ten days (an average of 44 km per day) with a further optional 18 km available. The terrain is mostly flat however there are steeper sections around Nuwara Eliya in the highlands. About 15% of the entire route is on poor quality pot-holed roads or dirt roads. A support vehicle accompanies the rides throughout the tour. We have graded the route as moderate. Your included bike is a 27 gear Stevens Galant hybrid with front suspension and will be the correct frame size for your height. Female and male frames are allocated accordingly when booking unless you specifically request otherwise. A pannier and water bottle holder are included as well as the facility to fit your own pedals or saddle if you wish to bring them. A support vehicle accompanies the rides throughout the tour. We provide spare parts and take care of the day to day maintenance. All you need to bring is your own helmet. Why not extend your holiday with a few days on the beach at Unawatuna?